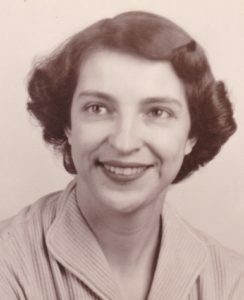 W h itehall-Catherine “Kay” McLauglin 90, of Broadway, passed away peacefully at home on Monday, April 1st after a long illness. Born on July 23, 1928 in Whitehall, she was the daughter of the late William McLaughlin and Josephine Lemely Marr. Catherine worked at Finch Paper Company, General Electric and Washington Correctional from 1980-1992. She was a member of the Whitehall United Methodist Church where she sang in the choir and also taught Sunday school with the younger children, which she enjoyed very much. Catherine was blessed with two children, five grandchildren and five great-grandchildren, Gram loved them all dearly. She showered her grandchildren with their treasured special days with sweet treats, care packages, smiles and hugs. Besides her parents she was predeceased by her brothers Edward McLaughlin and William McLaughlin Jr. Survivors include her son Brian McLaughlin (Allie Webster), daughter Catherine McDonald (Virgil), her sister Fran Doty and brother Leslie Marr. Grandchildren; Katrina McLaughlin (Nigel Reeks), Nathan McDonald (Marissa), Tyler McDonald (Melanie), Eleni Tyrell and Brian McLaughlin Jr. Great- Grandchildren; Sara Atwood, Izabella Reeks, Reginal Reeks, Annabel McDonald, Ian McDonald and many nieces and nephews. Family and friends may call from 10am to 12pm on Thursday April 4, 2019 at the Jillson Funeral Home Inc. 46 Williams Street, Whitehall, NY 12887. A funeral service will follow calling hours at the funeral home with Pastor Daniel Thompson of the Whitehall United Methodist Church Officiating. Burial will be private in the Greenmount Cemetery. The family would like to thank the following for their care; Forth Hudson Health System, CWI, High Peaks Hospice and her niece Stacey Petrikas.